David Lynch came into the game in the fifth inning, his Port Charlotte Rangers down 1-0. The reliever then proceeded to shut down Lakeland over the next four innings, giving up just a single walk. He also picked up the win as Port Charlotte scored four. "My curve ball was over the plate," Lynch told The Lakeland Ledger after that July 1988 contest. "My curve was working good tonight." Lynch's curve served him well that night and helped him to a career that spanned nine professional seasons. But it couldn't help him to the majors. Lynch got to AAA for parts of seven seasons, but never did make the majors. 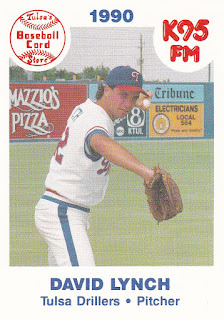 Lynch's career began in 1987, taken by the Rangers in the 22nd round of the draft out of the University of New Orleans. At New Orleans, Lynch shut down the University of Miami over nine innings in a February 1987 contest, giving up just four hits. It was an outing noticed by Miami coach Ron Fraser told The South Florida Sun Sentinel. "Their left-hander (Lynch) did a fine job," Fraser told The Sun Sentinel. "He was the difference in the game. He was just wild enough to be effective." But Lynch's time at New Orleans didn't help his draft status. In 1983, he was taken by the Phillies out of high school in the fourth round. After college, the Rangers took him in the 22nd. His second season was spent largely at single-A Port Charlotte, with a 2.02 ERA in 36 appearances, all in relief. Lynch also had six saves, his fifth coming in mid July, striking out all four batters he faced. Lynch made AA Tulsa in 1989 and AAA Oklahoma later that year. At Tulsa, Lynch got into 39 games and 51.2 innings. He gave up just five earned runs. At Oklahoma City, though, he gave up eight earned runs in 11.2 innings. One more season in the Rangers system and Lynch was sent to the Dodgers in a three-player deal. He split the year between AA San Antonio and AAA Albuquerque. Then came two seasons in the Reds system between AA and AAA. His final two seasons came in 1994 and 1995 with the Indians at AAA Charlotte and Buffalo, his career ending without him making the majors.